Before my initial expedition to the Montreal Chinese Buddhist Society (henceforth called "MCBS"), I prepared a sheet with an organized list of questions. Optimistically, I titled a second sheet "Answers". As it turned out, many separate visits and many hours of research were required before anything clearly resembling an "answer" allowed itself to be revealed. This initial slump was by no means a failure of the MCBS' kind and enthusiastic congregation. Although the language barrier was a perpetual difficulty, those members more capable at speaking English volunteered their voices and time to help me understand their beliefs. Without their generous patience, this report would have been impossible. Characteristic of the philosophy of the religion, the entire congregation welcomed me with open arms. I'd like to express particular appreciation for the patient help of Wan Xua Xu, Wan Zhen Zhou, Irene, Xinging He, Zou Liping, and Gong Jiasi. The purpose of this paper is to give a contextual description of the MCBS' history, congregation, iconography, and ritual. This project report is divided into five sections. Section I briefly outlines the history and tradition of Pure Land Buddhism. Section II examines the social structure of the temple, placing it within the larger context of Pure Land Buddhism worldwide. Section III looks at the temple's ritual objects. Section IV analyzes the different aspects of the weekly afternoon ceremony. Section V concludes with a short reflection on my personal experience with the temple as a practitioner. I have also included an Appendix with a temporal breakdown of the weekly ceremony. Before continuing with the paper, I must make a preliminary remark concerning my source material. Much of my information is derived from a mish-mash of different "reprinted" books given to me by the MCSB, or from the mouths of the MCBS members themselves. These "reprinted" books often contain scant information concerning their sources, and thus referencing information has been difficult. The congregation has verified almost all information gleaned from these books, and if there was ever a disparity I have taken the informant's opinion over the book's opinion. Hence, although many texts were flipped through, the vast majority of the factual information that I have provided may be credited to my informants, and as such is not directly referenced to a specific page of a book. When information was directly lifted from a text, I have made use of parenthetical references when appropriate. A complete list of texts, interviews, and Internet websites that I have used for this paper is located at the end of this document. A quick review of the basic characteristics of Pure Land Buddhism will help place the later sections of the report in context. Specifically, I will examine the inclusive of nature of Pure Land's origin, practice, goal, and membership. Both Ch'an and Pure Land Buddhism gained prominence during the Táng Hui-ch'ang Persecution (845 AD). While some Buddhist schools of thought focused on intellectual concerns, Pure Land and Ch'an Buddhism were more oriented towards actual practice. Opening itself up to the masses of potential lay practitioners, Pure Land concentrated on "simplicity, pragmatism, flexability, and accessibility" (Shih, 3). Pure Land's practices were meant to make enlightenment easier and more efficient, simplifying the ritual and requirements so that it could be a religion for everyone. In contrast to Ch'an, which "returned" to stricture and more intensive practices, Pure Land was much less demanding. Participation in Pure Land involves three main commitments: faith in the words of the Buddha as written in the sutras, a sincere desire to be reborn in the Pure Land, and participation in the practice of nien-fo (a more detailed examination of this practice is included below in Section IV). Horizontal Escape summarizes these as the three legs of faith, sincerity, and practice (58-138). Similar to many other forms of Buddhism, Pure Land also requires that the practitioner lead a generally moral life, which includes vegetarianism. Neither the three legs, nor the more general ethical commitment are difficult to understand or to practice. Hence, these obligations may appeal to almost any type of person. The goal of the Land Practitioner is to be reborn in the Pure Land. Administered by Amitabha Buddha, this Land is described in the most glowing terms, where every sentient creature expounds the Dharma, and no one is ever hurt. Importantly, however, rebirth in the Pure Land is not equivalent to enlightenment. Sometimes described as a horizontal shift, all of your previous karma comes with you. One of my informants described the Pure Land as a very good college, where you can easily attain enlightenment in one lifetime. This aspect gives Pure Land a generally more positive nature than other forms of Buddhism, thereby giving it a generally greater appeal. As a religion attempting to include as many people as possible, it does not demand its followers convert to a rigid monastic lifestyle. Most practitioners are lay practitioners. Pure Land literature also emphasizes the merits of other forms of Buddhism, so as not to discourage potential future members. Other sects such as Ch'an are not described as incorrect, they are merely inefficient. In one of my interviews a member of the congregation reminded me that many Zen masters have converted to Pure Land in their old age. All of these aspects of Pure Land's philosophy exhibit its inclusive nature, a nature that reveals itself in the manner of the MCBS and its congregation. The MCBS is not directly affiliated with any larger umbrella organization, although it does hold loose ties with organizations similar to itself around the world. These include the Amitabha (Six Harmony) Buddhist Organization of Canada (Markham, Ontario), and the Dallas Buddhist Association. Direct collaboration with other temples is rare, except for the purpose of organizing special events. There is no formal network between temples; information is instead passed along by word of mouth through fax and telephone. The congregation considers Venerable Master Chin Kung to be their "professor", although this term should be taken with a grain of salt. Kung is currently in Singapore, and has a long and famous history of studying and teaching Pure Land Buddhism as well as founding many Pure Land organizations. Interestingly, both his methods and his messages can be described as "modern". He uses diverse forms of media, including radio, television, cassette tapes, CDs, videos, and even the Internet to broadcast his messege (there are real-time audio lectures available on the Hwa Dzan Pure Land and Learning Center website). Available online, his messages include the following quotations: "Cultivation is not unusual, it is part of our everyday life", "Buddhism is an education, not a religion…we do not worship the Buddha, we respect him as a teacher", and "Using spiritual penetrations and psychic abilities to attract people to believe in Buddhism is not proper teaching and only serves to mislead others" (Amitabha Web). All of these mottos are "down to earth" and would certainly be judged unobjectionable, even by the most discriminating child of the West. One of his disciples, Venerable Wu Ling, is a member of the Dallas Buddhist Association (mentioned above). This association ships out many free tapes of her lectures to the MCBS. Forty-seven of her tapes were given to me because, as an informant explained to me, she is excellent communicating with Americans. Perhaps this is due to her clear and comforting southern accent. Before explaining any specifics about the different roles of members of the congregation, I must establish that there is no declared hierarchy. Generally, everyone is on equal footing. This harmonizes with the general philosophy of Pure Land that implies equality between every sentient being, including animals, humans, ghosts, and even Buddhas. One of the founders of the MCBS, Ms. Jiang, may be considered the "leader", although she plays a passive role and rarely attends the weekly services due to her old age. She, along with the other older members of the congregation, donates the majority of the funding required, although voluntary donations are accepted from everyone. A senior member explained that everyone gives according to his or her ability. Other more defined roles include the few people who take care of day-to-day maintenance, as well as those who occasionally take a more prominent position as a teacher. In theory, everyone teaches new members, offering advice and interpretation. Some members, such as Wan Xua Xu, play a more prominent role due to a greater background in studying Buddhism and a more extroverted personality. Larger decisions are made as a group during informal meetings, usually taking place after the weekend service. While discussions appear to be led by certain individuals, all members have an equal chance to speak. Most recently, there was a meeting to discuss the impending arrival of a student of Chin Kung. This student, Xu Xing, is coming to Toronto to hold a three-day retreat in late May (organized by the above mentioned Amitabha (Six Harmony) Buddhist Organization of Canada). Wan Xua Xu found that 26 members were interested, and thus made phone calls to arrange for application forms to be sent to the MCBS so its members may participate. Scrounging up information concerning the history of the MCBS proved to be difficult because no senior member speaks English. A short (and admittedly incomplete) story has, however, managed to emerge. Two Chinese immigrants from Hong Kong, Ms. Jiang and Mr. Ma, founded the MCBS in 1990. Neither of the founders currently attends the normal weekend ceremony due to their old age; however both come to larger ceremonies and continue to donate money. Since the MCBS was founded, it has not moved from its current location. The senior congregation, those who joined the temple seven or more years ago, now participates in a morning ceremony on the weekends, while the more recent members participate in an open afternoon service (some of the senior people attend the afternoon ceremony as well). Currently, there are three generations of participants. The oldest generation varies in age between 74 and 84 years old, four of whom participate in the afternoon ceremony. There youngest generation consists of only two members (one of whom only comes once a month). I have been told however, that there are eight students between the age of twenty and twenty-four years old who participate in the summer months. There are between ten and fifteen "middle-aged" members of the congregation. The oldest generation is largely from Hong Kong. Everyone else comes from either Mainland China, or the countries of Thailand and Cambodia. Almost everyone has come to Canada within the last fifteen years. Concerning languages, 70% originally speak Cantonese, while 30% originally speak Mandarin. No one has English as a first language. Strikingly, only about 20% of the congregation is male. When asked why this was the case, different informants offered different responses. Some attributed the difference in attendance to men's busier lifestyle, other believed that women had more merit then men, so it was only natural that more of them would be worshiping. When asked how he or she originally discovered the temple, a member will often reply that they heard about it from a friend. The MCBS is generally known among Montreal's Chinese community, and does no active recruiting. Although members do hear about the temple through word of mouth, the community rarely sees each other outside of the weekend services. When asked why he or she worships at the temple, the primary reason given is that the temple has a good atmosphere, and is therefore more conducive to worship than his or her home. No formal "assimilation" classes are taught, although I observed one member receiving help in order to fill out her electric bill. Characteristic of the MCBS, if any member needs assistance other members are glad to help, although there is no formal structure. Image 1: An overhead view of the temple. Image 2: A 360° view of the MCBS main room. The MCBS rents the third floor of a building owned by La Société des Francs-Maçon Chinois located in Chinatown. Four rooms comprise the bulk of this floor (see image 1 and 2). Walking through the front door, one enters the main area of worship roughly 10 meters long (all measurements are rough estimates) and 6 meters wide, which includes a main altar on the West (right) wall, two smaller altars on the South (top) wall, windows and a poster of Amitabha Buddha on the East (left) wall, and a bookshelf on the North (bottom) wall. To the left is a small office; to the right is a small area with a few coat racks and a few shelves of tapes and books. Walking into this area, and turning left leads to the back room about 5 meters long and 4 meters wide. This back room acts as a kitchen, dining room, and storage space, containing a refrigerator, a sink, a large table, a television, and large shelves stacked with large boxes. Image 3: The front altar. 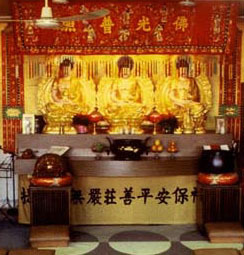 The most striking element of the main room of worship is the front altar (see image 3), which consists of three large golden Buddhas, a large incense burner, offerings of flowers and fruit, small jars of pure water, two pictures of protective Bodhisattvas, a hanging banner, and a number of musical instruments including drums and wooden fish. This central altar is the main focus of worship, placed in the West because that is the direction of the Pure Land. Image 4: The Three Buddhas, from left to right: Amitabha Buddha, Sakyamuni Buddha, and Bhaisajya. 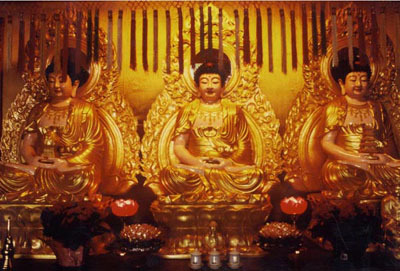 The three large Buddhas are, from left to right, Amitabha Buddha, Sakyamuni Buddha, and Bhaisajya Buddha (see image 4). Amitabha Buddha is the central figure of Pure Land Buddhism. 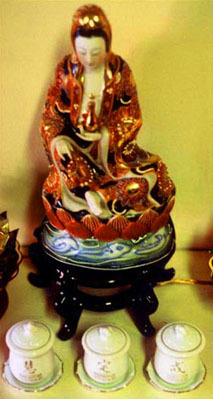 In his hands is a Lotus, a central symbol of many Buddhist sects that offers many analogies. It bears a flower, like the Dharma bears enlightenment, and once the flower has blossomed it falls off, representing the casting off of the Dharma once one has attained enlightenment. Also, the lotus grows out of the mud, analogous to the growth of the historical Sakyamuni Buddha out of the human Siddartha. The statue of Sakyamuni Buddha portrays him with an alms bowl in his hands. Traditionally carried by monks to collect offerings, the alms bowl is a "symbol of monasticism, renunciation and even the Buddha's Law" (Leong 75). On Sakyamuni's left, Baisajya Buddha carries a pagoda, which has traditionally held the cremated remains of monks as well as sacred objects. Also known as the Medicine Buddha for his healing powers, Bhaisajya Buddha reigns over the Eastern "Pure Lapis Lazuli Paradise" (Seeker's Glossary of Buddhism 363), complementing Amitabha who reigns over the Western Pure Land. All the Buddhas are golden, symbolizing both their purity and their immortality. Image 5: A collection of offerings displayed on the front shrine. 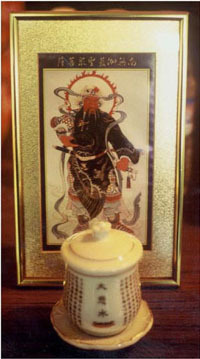 Image 7: A protective Bodhisattva, in front of which is one of the side water cups. 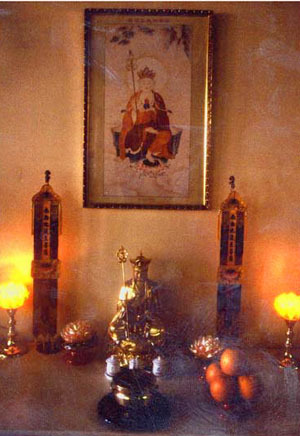 Image 6: The three cups of water in the center of the main shrine. 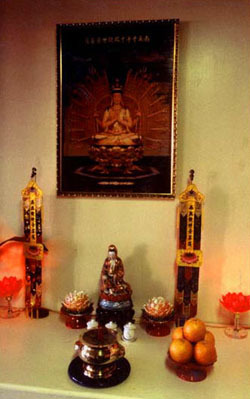 In front of the Buddhas are various offerings in the form of incense, fruit, flowers, and water (see image 5). 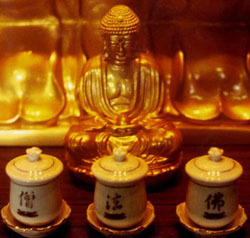 On each of the three central cups of water there is a Chinese character representing the one of Three Jewels of Buddhism (see image 6). These Three Jewels are the Buddha, the Dharma (the Buddhist doctrine), and the Sangha (the Buddhist practitioners). In front of the protective Bodhisattvas at each end of the altar rests another water jar with the sutra Dharani of the Most Compassionate One written on it (see image 7). Rather reluctantly, one of my informants told me that in the past people believed that when pure water was placed in a jar with this sutra on it the water gained medicinal powers. 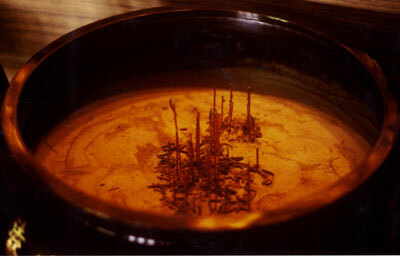 Incense, as well as adding to the atmosphere of the temple, is also considered an offering to the Buddha. An informant explained to me that the smoke symbolizes a practitioner's previous transgressions floating away. One last item of interest is a large banner hanging above the altar (see image 3), which reads "Universal Illumination by the Buddha's Radiance". Although this is a slogan of a recognized organization called The True Buddha Light Organization, a member of the congregation pointed out to me that the symbol of light emanating from the Buddha was common to many sects of Buddhism, and that the MCBS was by no means affiliated with any larger organization. On the south side of the room there are two altars that pay respect to the two most popular Bodhisattvas in the East Asian Buddhist tradition (The Seeker's Glossary of Buddhism 319). On the left is Ksitigarbharaja and on the right is Avalokitesvara. Repeating the motif of the front altar, both side altars have offerings of flowers, water, fruit and incense. The water jars on bear different inscriptions that the ones on the Western altar. Instead of the Three Jewels, the Three Learnings are represented, consisting of discipline, concentration, and wisdom. Image 8: The shrine of Bodhisattva Avalokitesvara. Image 9: A close up of Avalokitesvara's statue and three water jars. Bodhisattva Avalokitesvara (Kuan-yin) is known as the Bodhisattva of compassion. Although commonly represented as a woman, in this temple Avalokitesvara is believed to be a man. He is one of the Three Pure Land Sages (the other two being Amitabha Buddha and Bodhisattva Mahasthamaprata) who bring people to the Pure Land when they die. He represents the epitome of the Buddhist virtue of Skillful Means, possessing one thousand eyes in the palms of one thousand hands which can both see a person's suffering and help him or her break free of it. Image 10: The shrine of Bodhisattva Ksitigarbharaja. Image 11: A close up of Ksitigarbharaja's statue and three water jars. To the left of Avalokitesvara is Bodhisattva Ksitigarbharaja, who has vowed that "Not until the hells are emptied will [he] become Buddha" (The Seeker's Glossary of Buddhism 319). This represents Pure Land's deep sense of optimism and equality, showing that everyone can be saved. Image 12: Sakyamuni Buddha as a boy. Other objects of religious significance include a statue of Sakyamuni Buddha as a boy, a poster of Amitabha Buddha, and various examples of calligraphy. The statue of Sakyamuni shows him with one hand pointing up and one hand pointing down (although this finger has been knocked off), representing his domain to be everything between the sky and the earth (see image 12). Above the poster of Amitabha Buddha is written the words "Treat the commands as if they were the Master". Two other examples of calligraphy are displayed above the sink, to the right of Bodhisattva Avalokitesvara. The top example is written by Zhao Pucho, and below that are some words written by Ming Shan. Both are well known Buddhist monks from China. One of my informants explained to me that both calligraphers knew each other and sometimes wrote poetry together. Image 13: A hia-qing robe (taken from Leong 77). Central to the ceremonies are both the robes that the practitioners wear and the leather prayer cushions used for prostration and meditation. The MCBS uses square and slightly angled cushions that help posture. During the ceremony the practitioners wear hia-qing robes, whose style originated in the Han and Tang dynasties (Leong 77, see image 13). These robes are black, and made of three unequal lengths of clothes, representing the Three Jewels (mentioned above). On the collar are five lines of white thread, separated by a few centimeters, as well as a large number (between twenty and forty) of closely spaced blue lines. Unfortunately, I was unable to find a concrete explanation of the symbolism involved in this stitching motif. These robes are typical of lay practitioners who have not formally taken any precepts. One of my informants explained that the hia-qing serve the purpose of a uniform, by establishing a sense of order and equality, and by separating the temple space as sacred. Throughout the ceremony, each member of the congregation remains either in front or on top of their prayer cushion (except while walking). These cushions are in horizontal rows, which are divided in half by an aisle running through the center of the room (see either image 14 or image 15). Each side possesses a generally equal number of people who are always either facing forward (West) toward the main altar, or inward toward the center aisle. A member of the congregation pointed out to me that worship should always be directed towards the Western Pure Land. All the men are at the front of the right side of the room. Explaining this, one of my informants related that when the walking began, the men must lead the women due to tradition, and must therefore take their place at the front on the right (see image 14). Leong's book offers the additional explanation that the congregation was traditionally grouped in two halves, with the "junior or female participants on the left, referred to as the Western rank while the senior or male participants stood on the right, referred to as the Eastern rank" (23). This explanation also corresponds to the two Buddhas that flank Sakyamuni at the altar. Amitabha, representing the Western domain is on the left, while Bhaisajya Buddha, representing the Eastern domain is on the right. Since a thorough timeline of the ceremony is given in Appendix I, the focus of this section is the religious significance and symbolism involved in the actions. Nevertheless, I will begin with a brief outline of a normal weekend ceremony. Some members of the congregation arrive early in order to prepare for the ceremony and have an opportunity for personal worship. Setting up for the afternoon involves placing the cushions in their proper places, lighting incense, and playing a tape of singers reciting the name "Amitabha". There is a generally relaxed atmosphere as people begin to flow in, put on their robe, and take their position. The more formal service begins with a reading of sections of sutras. Even while this is taking place, more people arrive. After the reading, the congregation stand up, prostate three times, bow, and then begin to chant along to a tape of accompanying voices and percussive instruments that is periodically flipped over. The first chant is the Amita (Amitabha) Sutra, followed by the song Praise of Amitabha Buddha. When this chant ends, the process of Buddha Recitation (nien-fo) immediately begins. Initially, the words "Namo Amitabha" ("Praise to Amitabha Buddha") are slowly repeated. The entire congregation threads its way in between the prayer cushions and around the room three times (see image 15), before finally taking their seats. As time goes by, the congregation and accompanying music begin to speed up. The word "Namo" is eventually dropped, and instead the congregation just chants "Amitabha" quicker and quicker, until a final slow incantation of the Buddha's name, which is followed by five minutes of silent meditation. Part of Parimana Gatha is then sung, followed by a quick stretch of the legs. The congregation then stands up and begins to chant the song "Praise of Amitabha Buddha" again. Events repeat themselves until the period of silent meditation is over. Following this, the congregation stands and a different section of Parimana Gatha sung, along with the extra songs Samantabhadra's Admonition, and The Three Refuges. After three prostrations, and a bow, followed by a dedication of the day's service by Ms. Zhou, the service concludes with three more prostrations, and a bow. Following the formal ceremony, a taped lecture is played for anyone who wishes to remain and listen. There are other items of interest that happen during the service. Periodically, a member of the congregation will light some more sticks of incense. Also, at certain times during the service Ms. Zhou, who takes her place on the right end of the left side at the front (see image 14), will bow. She is a senior member of the group, and one of the few members who know the proper times to bow. Although she is the only one bowing, she acts as a representative of the congregation, all of whom receive merit. Throughout the ceremony there are two main hand positions. The first and most common position places both palms together, at the level of the chest. A small space should be left between the palms that symbolically holds your heart. The other hand position involves holding the hands in front of the navel, placing the right hand on the left palm, with the thumbs touching and arms relaxed. One member of the congregation explained to me that this allowed the practitioner to receive the light of Amitabha Buddha (exactly when each of these hand positions is used is described in Appendix I). Like the water jars at the front altar (mentioned above), the three prostrations represent are correlated to the Three Treasures. In each prostration, the forehead and the knees are placed on the prayer cushion, with the each hand placed against the cushion on one side of the head, palms facing up. Again, the open palms allow the practitioner to receive the light of Amitabha Buddha. Following the three prostrations is a final bow, which according to an informant says "hello" to Amitabha Buddha, while at the same time asking his permission to practice. In response to my perplexed look, the informant compared the bow to the act of asking one's parents' permission to wash a dirty dish (although my face remained perplexed, no further explanations were offered). Chanting Amitabha Buddha's name is part of a larger activity, called nien-fo. "Nien-fo" is a Chinese translation of the Sanskrit "Buddhanusmrti" meaning, "to be mindful of the Buddha" (Shih 27). Probably the most important element of Pure Land practice, nien-fo may involve chanting the Buddha's name, visualizing the Buddha in the Pure Land, or meditating on the Buddha's nature. This practice has an import in both the short and long term. In order to properly understand nien-fo, a brief synopsis of some Pure Land philosophy is required. According to Pure Land Buddhism, every sentient being is equal. "Equality" is taken to the extreme, implying that humans do not merely have the same status as Buddhas; humans are Buddhas. One of my informants related to me that we are all naturally Buddhas, but that we have just been polluted by the senses. Once the mind is cleaned, this inner Buddha-nature is realized. This cleaning of the mind is accomplished through nien-fo. In the short term, one informant explained, single-minded concentration on the name of Amitabha pushes polluted thoughts out of her mind, leaving her feeling more peaceful, relaxed, and compassionate. Nien-fo helps her see her inner Buddha-nature. In the long term, nien-fo is practice for death. If the practitioner's mind is clean, only thinking "Amitabha", the Three Sages will come and take him or her to the Pure Land when he or she dies. This is the ultimate goal of Pure Land Buddhism, because rebirth in the Pure Land all but ensures the attainment of enlightenment in the next lifetime. The practice of nien-fo is represented at MCBS's weekend service through the repeated chanting of "Amitabha". The gradual acceleration of the chanting of "Amitabha" induces an increase in focus. Upon coming to a climax, the chanting stops in order to allow for mental concentration on Amitabha Buddha. When this silent meditation ends, everyone may be seen grinning at each other, expressing a mutually understood joy. Although the research process was sometimes trying, the creation of this report has been very rewarding. During some of my visits to the MCBS I had the opportunity to participate in the afternoon ritual. Donning a black hia-qing robe, I mumbled sheepishly through the sutras, and ambled past the prayer cushions trying to chant "Namo Amitabha" while keeping pace with the line of people. Initially, this ritual felt awkward and forced. After only a few tries, however, I began to sink into its flow. Learning to slow down for two and a half hours on a Sunday afternoon, difficult as this may be for a fast-paced University student, became enjoyable. Moreover, attempting nien-fo myself helped me gain a personal insight into a concept I had previously only read about. Both prior to, and during my research I practiced zazen meditation between three and five times a week. When compared (as they often are) Zen and Pure Land are often said to be quite similar except that Pure Land is easier and more efficient. In zazen meditation, I focus only on my breathing, trying to remain as still and as silent as possible. In nien-fo the focus is instead placed on the chanting of "Namo Amitabha". Both carry elements of repetition and concentration, and as such may be considered similar. However, chanting is a more engaging activity than breathing, which makes it easier to concentrate on. Practicing nien-fo offered other interesting rewards. Sometimes Saturday night is not kind to Sunday morning, and I would arrive at the temple with a tired head. During the chanting my mind would wander, yet my mouth would continue to repeat "Namo Amitabha". When my mind returned, I would suddenly become conscious of my words, but I no longer needed to consciously create them. I could observe myself chanting, as disconnected from my voice as if it were someone else's. My voice and my consciousness had until that point felt eternally tied to my conception of my "self". Words are the direct expression of the thoughts, and when they are disconnected from the self, thoughts are all that are left. Perhaps this separation of the voice from the "self" is the first step of a long journey towards cleaning the "pollution" from your mind, so that it may become clear enough to truly comprehend its own essence as Amitabha. Turning now from the past to the future, I would like to conclude by pointing prospective explorers toward some interesting aspects of the MCBS that I regret not examining closer. There are at least three different ceremonies that I did not have the opportunity to attend: the morning service of the senior members, a service for the dead, and the special services for the different Buddhas' birthdays. Each one of these, no doubt, offers a fascinating glimpse into both the Pure Land religion and the local community who practice it. Although difficult to unravel, a detailed description of the temple's history would also be fascinating. Founding a temple would be difficult for anyone, let alone a pair of Chinese immigrants who are unable to speak English. Currently, the MCBS has a clearly defined generation of elderly first generation Chinese members, who will unfortunately not be around much longer. The envelope of opportunity for gathering experiences and information is closing, and I would encourage any further researchers to follow up on this report with a deeper look at these more intimate aspects of the temple. Chihmann, Upasika (Miss P. C. Lee of China). The Four Buddhist Books in Mahayana. (reprinted by) Taipei: The Corporate Body of the Buddha Educational Foundation, 2001. Leong, Harry. Ritual Implements, Tools, & Objects of Chinese Buddhism. Taiwan: Yuan Kuang Buddhist Publications, 2001. Tripitaka Master Hsuan Tsang. The Prajna Paramita Heart Sutra. Trans. Venerable Dharma Master Lok To. New York: Sutra Translation Committee of the United States and Canada, 2000. Samantabhadra's Vows. New York: Sutra Translation Committee of the United States and Canada, 1997. Grandmaster T'an Hsu. On Amidism. Venerable Tai Kwon. To Be Born in a Lotus. Upasaka Li Ping Nan. A Buddhist Goal that can be Achieved in One's Present Life. Master Chu-hung, Master Tsung-pen. Pure Land, Pure Mind. Trans. T. C. Cleary. New York: Sutra Translation Committee of the United States and Canada, 1994. The Buddhist Liturgy. Trans. New York: Sutra Translation Committee of the United States and Canada, 1993. Dharma Master Thích Thien Tâm. Horizontal Escape, Pure Land Buddhism in Theory and Practice (Niem Phat Thap Yeu). Trans. Van Hien Study Group. New York: Sutra Translation Committee of the United States and Canada, 1994. Inagaki, Hisao and Harold Stewart. The Three Pure Land Sutras. Kyoto: Nagata Bunshodo, 1994. [collaboration of many authors]. The Seeker's Glossary of Buddhism. New York: Sutra Translation Committee of the United States and Canada, 1998. AMTB. http://www.amtb.org. Friday, April 12, 2002. Hwa Dzan Pure Land and Learning Center. http://www.amtb.org.tw. Sunday, April 14, 2002. Amitabha Web (Australia). http://www.amtbweb.org. Friday, April 12, 2002.